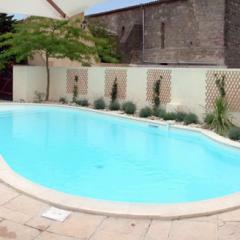 Self catering holidays near Carcassonne in the Languedoc. Situated in the heart of Cathar country, Montclar is ideally situated to explore the Languedoc. The romantic ruins of Cathar castles, perched high on mountaintops evoke tales of Templar knights, fair maidens and ancient legends. The medieval walled city of Carcassonne on an evening is unforgettable. When you’ve had enough of history, you can try whitewater rafting or explore the magnificent unspoilt countryside. You can also head for the Pyrenees, which can be seen from the village. The beaches of the Mediterranean are just an hour away. Beautiful Barcelona is three hours away. Montclar is in the wineproducing area of the Malepere. The foodmarkets are held on different days in differents towns and are good places to buy wonderful home produced fare and to take in the sights and sounds from one of the cafes around. After all this you can return to lounge around the pool. Whatever your preferences, you will have a wonderful holiday in Montclar. The area is easily accessible by road and air, with Carcassonne Airport (serviced by Ryanair) only 15 minutes away and Toulouse Airport (British Airways, Easyjet and Flybe) an hour's drive. Montpellier, Beziers, Perpignan and Girona are also within easy driving distance. For map and travel directions from Toulouse and Carcassonne click here. Superb location, lovely house and great pool. 2 weeks gave us a chance to fit in exploring and relaxing. Perfect!